The governor's support for increasing the number of Arizona children covered by vaccines comes as the legislature considers three bills that would expand the state's exemptions for vaccine requirements. PHOENIX — Arizona Gov. Doug Ducey suggested Wednesday he would veto legislation that critics say would lead to fewer immunizations. "I'm pro vaccination. I'm anti-measles," Ducey told reporters. Ducey said vaccines are good for children and helpful for public health. 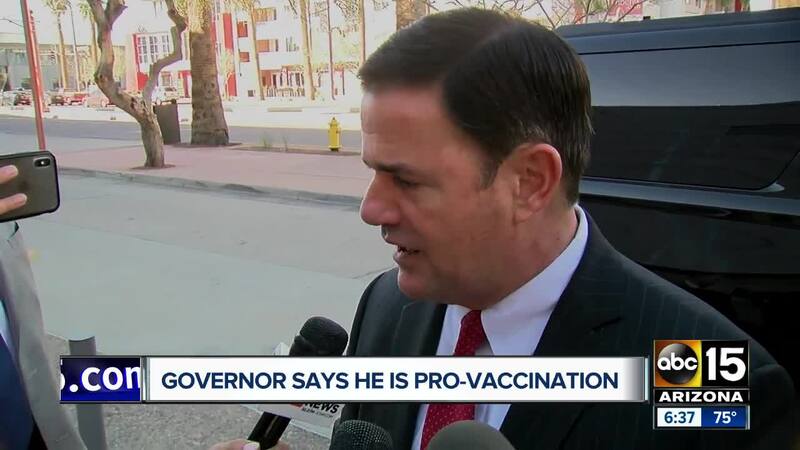 "I'm not going to sign any law that doesn't' promote or extend vaccinations in the state of Arizona," the Republican governor said. "We want to see more of our kids being vaccinated rather than fewer." A state House committee last week approved three bills that doctors and public health officials say would confuse parents, add unnecessary steps for doctors and ultimately reduce the rate of children receiving immunizations. The measures are supported by people who doubt the scientific consensus that vaccines are safe and effective. One bill would create a religious exemption from required vaccines for school-age children, adding to a personal beliefs exemption the state already has. The second would require doctors to provide lengthy information about all the ingredients in immunizations. The third would require them to tell patients about an antibody test that may help determine if someone is already immune to a disease, though doctors say it's unreliable for determining immunity, especially in a child who may retain antibodies from his or her mother. Rep. Nancy Barto, a Phoenix Republican who sponsored the bills, has said they're about promoting religious freedom and informed consent, not about opposition to vaccines. It's unlikely the legislation will even reach Ducey's desk. A committee hearing in the House last week revealed the measures may not have enough support to clear the closely divided House, and even if they do, the Senate health committee has rejected similar legislation.